Fanless, as you might expect, is the term used to describe a computer that does not utilize fans for cooling. Fans are one of the most common failure points for industrial PCs and draw in contaminants that can cause system slowdowns or hardware failure. Fanless computers are ideal for computer users looking to ensure optimal reliability, particularly in harsh environments subject to dust, debris or other airborne particulate. There’s an important distinction to be made between fanless computers and ventless hardware. Just because a computer is fanless, that doesn’t necessarily mean that it’s well protected from outside contaminants. Removing the fan is just one part of improving hardware reliability, the next step is ensuring that the system is able to cool effectively even without the need for vents in the enclosure. 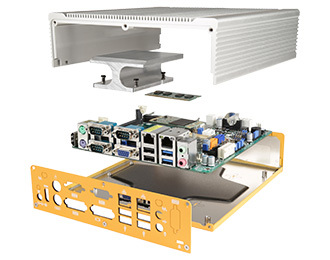 The term ventless has not been as widely adopted by the industry because it’s much harder to achieve, but Logic Supply uses it to indicate that a computer has no vent openings and is cooled by a combination of internal passive thermal management solutions and external heat dissipation fins. There are many benefits to fanless computer designs, but perhaps the most important is that they remove the most common failure point in computers, the fan. Many of our fanless systems can also be configured to be completely solid state, removing not only the fan but moving parts altogether, further improving reliability, especially in shock and vibration prone installations. With fully solid state solutions there is the added benefit of completely silent operation, ideal for laboratory, broadcasting or digital signage applications. What other aspects should I consider? Removing the fan doesn’t make a system fully solid state. Configuring hardware with solid state storage removes the final moving part (the spinning platters of an HDD), creating a system that is completely silent and highly resistant to dust and vibration. Utilizing wide temperature range components makes these solid state systems ideal for installation in a range of extreme environments.